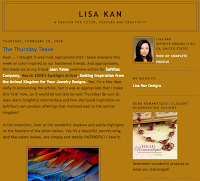 The lovely Lisa Kan has a new BLOG! 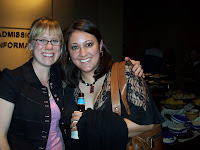 We both write for Stringing Magazine, but it wasn't till a show in Charleston, SC that we met in person. 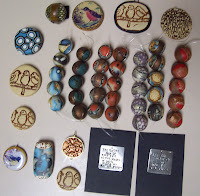 Ever since, I've been a fan of her stunning lampwork and her detailed writing style. 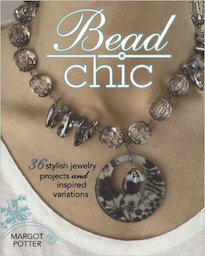 Check out her book, Bead Romantique! Humble Arts Foundation in collaboration with Ladies Lotto presents, "31 under 31: Young Women in Art Photography." The show is curated by Lumi Tan and Jon Feinstein. It runs from Saturday, March 1st to Friday March 28th. The opening reception is, this Saturday from 7PM to 9PM. The show is located at 3rd Ward in East Williamsburg. There will be an open bar and a DJ. It looks like it might be an interesting show, spotlighting some of today's young women photographers. Today at work, we got a special treat! My boss decided to bring us all some lovely cream puff pastries from Beard Papa's. Yum! This company by way of Osaka, Japan specializes in "fresh" and "natural" cream puffs. They were great! The Church of Craft is hosting a DIY celebration at the Museum of Art and Design on Thursday, March 6th from 7PM to 10PM in honor of the exhibitions: "Pricked: Extreme Embroidery," and "Cheers: A MAD Collection of Goblets." The evening will feature workshops, craft beers, a DJ, and guided tours. My friend Iviva Olenick will be leading an embroidery workshop focusing on embroidery as text or a narrative. Above Left: McCarren Park (2007), 5.75" X 3" embroidery on fabric by Iviva Olenick. Reading the title of this post may again make people who know me question my sanity, as I have long been infatuated with the world of olfactory stimulation. However, I was talking with Jenny and she introduced me to a site called, I Hate Perfume. 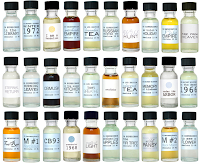 It's a collection of blends created by renowned perfumer Christopher Brosius. Just take a look and peruse the intoxicating scents and their bewitching descriptions. Don't forget to read his history, as it makes the title of this post and his website make sense. Here is a set of multiples that I did for a show last year. They are my submission for this week's Illustration Friday theme, "Multiple." I constructed them first by doing preliminary drawings on gesso-covered canvases. In making these first drawings, I played with various tints of white. 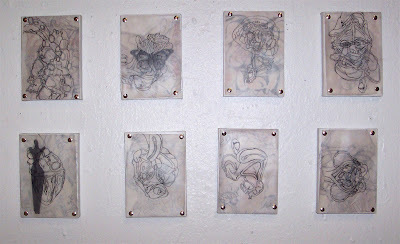 Then I stretched and pinned drawings done on pieces of vellum on top of them. I love the milky translucency of the vellum and how it distorts the drawings beneath them... creating ghosts peeking through and changing the surface drawings. With a few of them, I floated collage elements in as well. I've been meaning to do more... it's all a question of never having time. 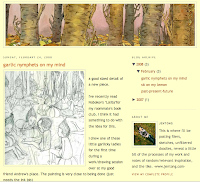 I just found out that the lovely and talented Jen Tong has started her very own art blog. CLICK HERE to check it out. This'll be a really great opportunity to get a glimpse behind the scenes of her artistic process and see what she is working on in the studio. I didn't watch the Oscars last night. I haven't really kept up with many movies this year. So it seemed pointless to watch an award ceremony for movies I haven't seen. However, it did come to my attention that one of my favorites, Tilda Swinton, picked up the Best Supporting Actress Award for her role in Michael Clayton. Bravo! Doesn't she just look marvelously statuesque in that picture? 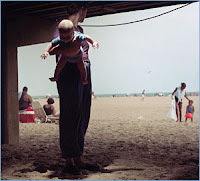 Left: "Coney Island" (1994) taken by Philip-Lorca diCorcia. Coney Island has a notorious reputation for being a dirty beach littered with hypodermic needles, drug-baggies, and used condoms. No one seems to mention that the sand sparkles. I remember walking along the beach one early morning hunting for beach glass and seashells and seeing the sands glittering in the early morning light. At first I thought that the Jergens's Soft Shimmer Skin Radiance Moisturizer (which I sometimes use) had washed off and that I was polluting the beach and that all the fish in the near by area would die. But then I realized that after years of having the waves pound the jetties, mica flakes were scattered throughout the sand. It's too cold for a trip to the beach right now and I'm in no condition to go anywhere at the moment, but the thought of walking along the glittering beaches warmed by the sun makes me feel a little better. I've been horribly sick these past couple of days. I've got a nasty stomach virus. I've hardly left bed all weekend. It hasn't been very good for my productivity. Ugh! I'm going to go lay back down now. 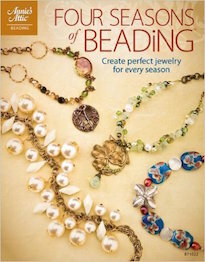 Beading Daily has teamed up with Stephanie Sersich to create a Glass Bead Design Challenge to help launch her new book, Designing Jewelry with Glass Beads. It has given me an opportunity to sit down and force myself to make something. Above is a quick design I whipped up. I've tentatively titled it, Tangerine Dream. I remember that it was one of our first CDs that we got. We played it over and over and I used to dream about birds flying in candy-colored clouds. 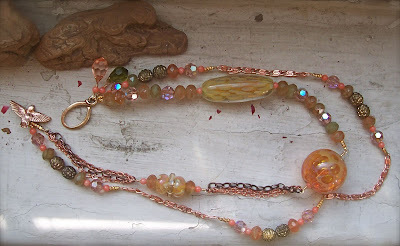 In this design, I've incorporated borosilicate glass from Family Glass, Czech Glass from Raven's Journey and Czech glass dangle pendants from Beads and Rocks, Swarovski Crystals from Fusion Beads, coral and vintage German Glass from Talisman Associates Inc., and copper chain from Ornamentea. Don't forget my favorite bird toggle from my family at Green Girl Studios. Right now, all I want is time. I want undisturbed time in a light-filled room to sit and make and think and do so without distraction or obligation. I would like the niceness of being able to go for a walk - a leisurely one set to the rhythms of my own internal beat. I would like the pleasure of being able to sit and talk and not wonder about the clock - if I've said too much or not enough. I'd like to sit and look at Turner paintings without wondering if I'll be late or if I need to get to bed. It's a rare thing to be contacted on MySpace by a band that claims you'll like their music and actually do just that: Like their music. 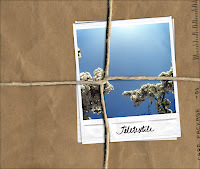 HOWEVER, this was totally the case with Teletextile. They're GREAT! I'm really glad that they emailed me. Sometimes I feel a little overwhelmed finding good new music to listen to. But when I do, especially via a happenstance such as this, it seems like a twinkling little gem found on the most mundane of streets. I really enjoy their music! So much so that I am now an owner of their CD, Care Package, and am planning to catch their show March 8th at Cake Shop in the Lower East Side and as many of their other shows that I can greedily take in! I've been good. Busy, but good. How have you been? I don't have a picture on-hand. I'm sure that were I to go back to Florida and dig through some boxes in storage, I might be able to come up with a photo... however a trip down South isn't in the foreseeable future. It would be best to contact someone like Teacher-Lady. She's got photos from every year stacked up in piles. As the former Newspaper adviser, she's bound to have at least one clear shot. My personal opinion is to leave it the way it is. I think that we try too often to hold on to parts of us that are in the past. Each of us has a season. Each of us were once young, younger, and still younger yet. Every generation is bound to make their own connections and create their own Time. Let them have their Time. They do not need to be in the shadow of a giant Indian, faded by age and decay. Leave the past in the past and move forward, lifted up by your memories but without trying desperately to cling to something ephemeral that cannot really be captured by paint or by anything else. And as I recall, it wasn't a popular "piece of art" when it was freshly painted in the first place. Nostalgia for times past has a way of distorting our feelings towards things, making us more sentimental for things that we don't always like... then or now. So, I say... leave it painted over. I've got my memories and they're better than any recreation of a bad painting can ever be. Just found out that the Dessert Truck sets up a few blocks away from work - delicious and convenient! Tonight I sampled the chocolate bread pudding and of course the creme brulee. Yum! It's certainly the best food I've eaten from a truck. Above: A short video clip of the crowd at the opening reception. I was fortunate enough to make my out to Exit Art to catch the opening reception for Brainwave: Common Senses. It's their current show featuring a bevy of talent from a wide range of artists in various media. It was really great seeing old friends and seeing the work of Naho Taruishi and Suzanne Anker up close and personal. 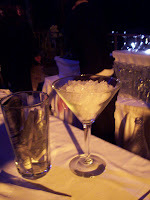 CLICK HERE to see the rest of the photos from the evening. 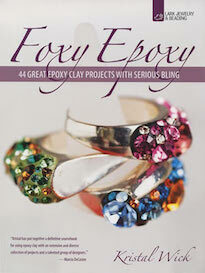 While in Tucson, an interview Cynthia did with the editor of the Jewelry Making section of Craftgossip was uploaded. It's an interesting blog full of interviews with respected artists we love! CLICK HERE to see it. My good friend Naho Taruishi is participating in a show up at Exit Art called, Brainwave: Common Senses. The opening reception is tomorrow, February 16th from 7PM to 10PM. Hopefully I'll be able to make it out and check out what she's been working on. It also appears that Suzanne Anker will have something in the show as well. For more information CLICK HERE. To celebrate Valentine's Day, we went out to the movies to see the new Spiderwick film. It was really fun! The visuals are really stunning. I've been really excited to see the movie ever since my family and I saw the trailer for the film at Faerie Con back in October. That's where we had the pleasure of meeting Holly Black and her husband Theo. To learn more about the books the movie is based on, CLICK HERE. This is a piece I did a while ago. I think it's fitting for the holiday spirit and all. While I was away, the new and final Specimen prints from Amy Walsh arrived. I am a little saddened that there won't be anymore. However, I am thrilled to have completed my collection of these amazing hybrid creatures masterfully wrought by a talented artist. I like to sit and look at them, thinking about where they live and what they eat and how they go about their lives. I'll post pictures of them when I have them all framed and mounted on the wall. Dark and early, I got up this morning to grab my flight back to New York. It was a pleasant surprise running into the Vintaj crew at the terminal and even more so to find out that our seats were right next to each other! It was good to have familiar travel companions. 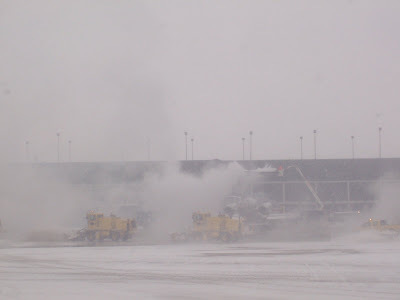 However, upon arrival in Chicago, the weather did not bode well for good travel conditions for destinations onward. In fact it was snowy and icy and promised to be even more chilly further down the road. My plane was delayed taking off, then delayed in landing. We were put into a holding pattern over La Guardia, circling over and over until we were running low on fuel and had to land in Hartford, Connecticut to refuel. Hours later after taking off and once again entering into a holding pattern over La Guardia, we finally landed. I am finally home. I am exhausted. My sinuses are burning like fire. It's time for bed. After a trip like this is done, I like to spread everything out and take pictures of my yield. I can't explain it. It's kind of like when we were kids and we would empty out our rice bags at Halloween and bask in the glory of piles of candy. I feel a certain satisfaction laying everything out. Now it's time for bed for real! 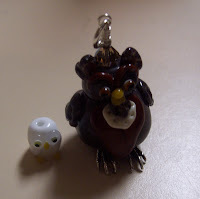 Just a quick shot of the new owls that I got here and will add to my collection. (I don't know how I'm going to squeeze them all into the curio-case.) They range in price - some were gifts, a few cheap, and others on the more pricey side. 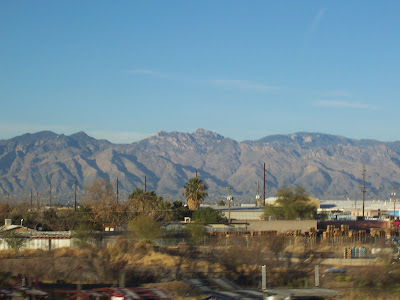 Above: Picture of the mountains looming over Tucson as seen from our way back from the Gem Mall. What an exhausting day! I am completely wore out. Today we went shopping. (Normally a fun activity, but in excess... utterly draining.) We started out at the Roadway Show at the Quality Inn, then we went to the Gem Mall, and then back up to the Quality Inn and then back again. I've been getting sick, so it hasn't made things much easier. Nor has it helped that everyone is leaving or has left already. Eva left today and both Cynthia and I were really bummed out about it. We're both very fond of her... so it was particularly sad to see her leave. I don't know when I'll see her next. After we finished up shopping, Greg and Bob picked us up and we went out to a Japanese restaurant for bento boxes. The food was delicious and tasted very healthy. The restaurant is called Yoshimatsu. To the left is a picture of Greg with Azalea at the restaurant. Still yet there is much packing that needs to be done. My sinuses are blocked and my head hurts. I'm going to lay down before I have to catch my early morning flight. I will miss my family, friends and this community that we create once a year here in Tucson. Today was the last day of the shows and it was bittersweet. I have enjoyed my time here in Tucson so much! It is great to be surrounded by my friends and family and to be inundated with creativity. I really do cherish this opportunity. It is such a blessing to be apart of such a vital and strong community. I couldn't help but feel a sense of loss as we packed up our booth. 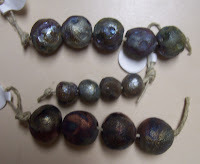 Left: I got these lovely Raku beads out in the tent at the Best Bead Show early in the morning. (I'm really glad that I got there early so that I could look around a bit.) The finishes on the beads are great! I love how rustic and organic they are. Left: Cynthia spotted this Anne Choi brooch (one that she hasn't made in a long time) in one of the other vendors' cases. She quickly snapped it up and gave it to me. Isn't it remarkable? 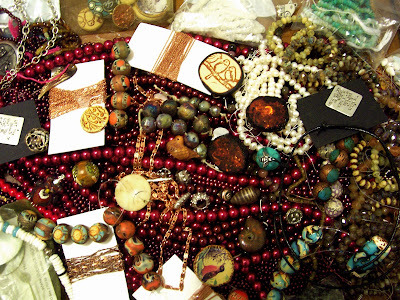 I know it was hard for her because she also collects Anne Choi beads. It was very thoughtful and generous of her to do so, when she could have easily kept it for herself. Thank you Cynthia! 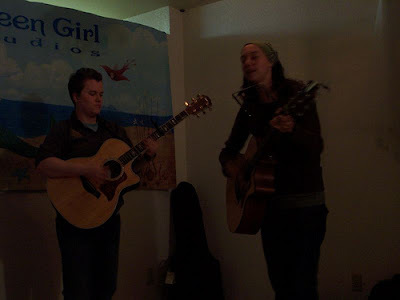 Left: Heather Wynn left yesterday. I will miss her so much! She's one of my best good bead show buddies! With people I like, I always feel as though there isn't enough time with them. She really is a true darling. Not only is she an amazing soul, but she's very talented. in the air, but what can one do? Just plan ahead for next year, I suppose. Every obstacle will be overcome. 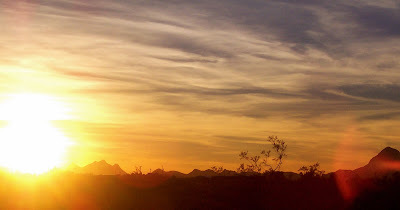 This is a photo I snapped of the sunset on Tucson as we were leaving the Best Bead Show. I'm kind of feeling a little worn down and will probably stay in and try to relax tonight. I hate missing an opportunity to hang out with my bead show buddies.. I'm just so tired and feeling a little beat. I'm more than a little bit tired, but having a great time! I was back at the Best Bead Show today. I didn't think I would be back today, but it looks as though I might be finishing out here instead of at the To Bead True Blue show as originally planned. Today has given me the opportunity to visit more with some of my other bead show buddies whom I haven't seen in a long time. 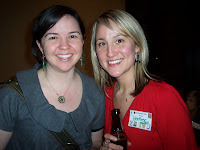 Left: I always love seeing Jodi and Heidi of Lillpilly Designs. It's not just because they've got great work, it's because they've also got an amazingly calm and soothing energy about them. It's almost guaranteed that they are always smiling. It is ever so nice to catch up with them. Left: Speaking of Lillypilly Designs, here are the new pieces that I picked up from them. Aren't they GREAT? I always enjoy using their merchandise. It is so elegant and delicate-looking. I really can't wait to make some pieces using these goodies. 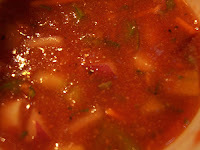 Left: One of the things that Cynthia and I look forward to every year is getting gazpacho from a place called Delectables here in Tucson. Show days can be long and grueling, but enjoying a cup of this manna from Heaven is refreshing and delicious. 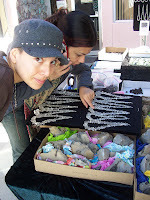 Left: Cynthia bought me a tray of Czech crystal from Lafaye of Beads and Rocks that are full of sparkle and glittering shine. I could hardly choose what colors I was going to get, as there were so many to decide from, but I finally narrowed it down. 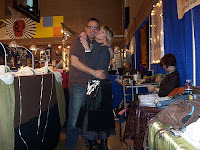 Left: Here's a sweet picture that I snapped of Tony and Lisa Blackwell of Zoa Art. Not only are they our neighbors at the Best Bead Show, but they are also sharing our rental house with us. It has really been fun being next to these two love-birds. 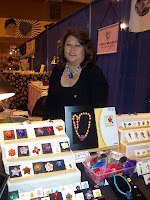 The gals from Fusion Beads invited me to the Swarovski Party at the Omni Tucson National Resort. It was a good time! We saw the winners of the Create Your Style with Crystallized Swarovski Elements competition and hung out with our favorite bead world celebrities. CLICK HERE to see all the pictures taken earlier. Unfortunately my batteries died and I didn't get any pictures from the after party at Legends. It was a beautiful day here in Tucson, Arizona! It warmed up quite a bit. 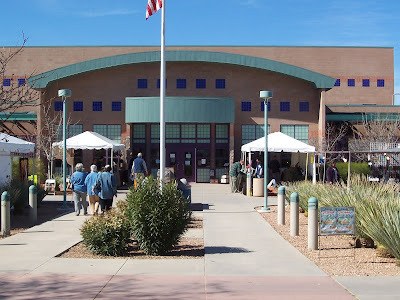 Above is a picture of the Kino Memorial Center where the Best Bead Show is held. (I worked this location today.) 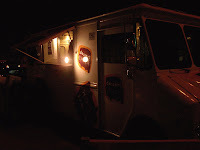 The picture was taken on my way up to the Taco Wagon, which for show food was quite excellent and very affordable! Yum! Left: Here are two sterling silver bird charms I got from Paula Best. Aren't they just darling? I love how pattern-oriented Paula's work is. I can't wait to play with them and make something. 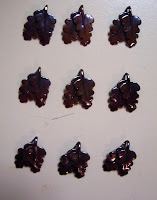 Left: These are the last nine Lea Ann Hartman oak leaf charms that Maureen of Pumpkin Hill Beads had at her booth. I bought them all! They are some of my favorites. 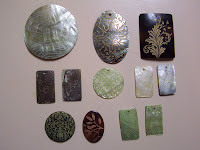 They are made out of shibuichi, which is an ancient Japanese copper and silver alloy technique. The variegated color is so warm and rich. Left: This necklace was a gift from Candice Wakumoto and Alethia Donathan of DACS Beads. 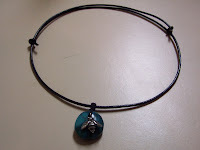 It has one of Candice's cast bee charms on a piece of turquoise. The bail was knotted by Alethia. I love the simplicity and wearability of it. Paula Best suggested that I make a stop in the side room to see the goodies at Penny Michelle and her sister-in-law Kimmie VanAntwerp-Poenisch's booth. It was so nice to visit with them. Both of them are true bursts of sunshine! Once I saw the little treasures at their booth, I had to have one! Left: They had a plethora of choices. The larger brown one was named, "Henry." The smaller white one has yet to be named. Aren't they just adorable? I am going to add them to my dragon's horde of owls. Even though I didn't work a show today, it was still very busy. We started the day off by making a quick stop at the gem show at the Howard Johnson to check out the Herkimer diamonds. Cynthia got a nice necklace there. Next we went grocery shopping for the Green Girl Studios party later in the evening. Once we got back to the house, we started cooking and preparing. It was really amazing having everyone come out to catch up and connect. Lots of our bead show buddies made it out to relax after a long day at the shows. CLICK HERE to check out all of the pictures of the party. Unfortunately there are some gaps in my photography as I was chilling out to the music of our wonderful special guest performers, Courtney Robbins and Leila Lopez. They were great! Another busy day here in Tucson! However, I did get a few minutes to walk around and pick up some goodies. I got to stop at Kelly Russell's booth and picked up two of her PMC creations. 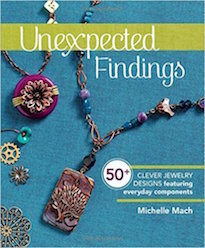 I also stopped at The Odyssey & Bead Expression for some nice niobium earwires and to chat with Marti Brown. It was nice to visit with some of my bead-show buddies who I haven't seen in a long time. After our show closed, we went over to our other location at the Best Bead Show for the late night. I got to see Candice Wakumoto and her husband Paul and talk with Alethia Donathan for a bit. I also got some really awesome cast findings from Candice. I love them! When we finally went back to the house, we went out for Indian food. Since the show closed so late, it was hard to find a place that was open. Luckily we found a place that was both open and delicious! 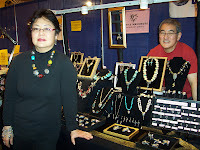 Left: Here's a quick picture that I took of Candice Wakumoto and her husband Paul at their booth at the Best Bead Show. 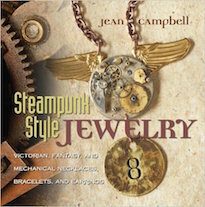 Candice has won several awards for both her lovely jewelry design and masterful PMC sculptural jewelry components. Left: Here's Alethia Donathan behind her booth. She's got some lovely beads that she makes out of glass. Alethia is one of the owners of a bead shop out in Hawaii and teaches beading to a group of advanced high school students. She and Candice bring me goodies from from Hawaii! I love them! Today I didn't get to go shopping. We were just too swamped at the table to look around. I did however end up getting lots of presents! How delightful! 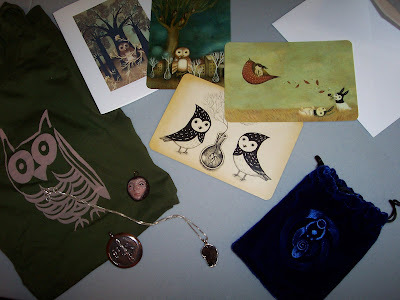 I got a cute little owl t-shirt (which I'm going to wear tomorrow) from Weasel, a owl medallion from Bob, a necklace that's supposed to be good for all sorts of magical things from Cynthia (oddly enough through someone I used to know way back when in Florida), a painted head and postcards from a really cool artist also from Cynthia. I'm just pleased as punch! Though this post is awfully revealing of my owl fetish. So, eventually I got here. It turns out that the snow that I was so concerned about canceling or delaying my flight ended up benefiting me. Who knew? I got stuck in traffic on the way to the airport and was running 30 minutes late! Crazy. When I got to the airport they said that my flight had been delayed slightly and that I had plenty of time to catch it. What luck! Many hours later, Greg and Bob Burkett were picking me up from the airport here in Tucson. It was so nice to see everyone. Our friend Eva is helping out with the shows and it was really good to catch up with her. I haven't seen her in a while now since they've moved out to the Northwest. It was also delightful to see Tony and Lisa Blackwell of Zoa Art who are sharing the house with us. Best of all... it was really wonderful seeing Girl Wonder! She's getting so big. I hugged her so much. Today was the first real day that I was here in Tucson. 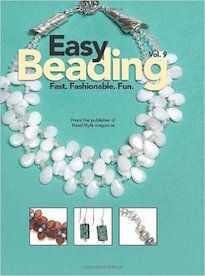 We were setting up at the Manning House for the To Bead True Blue show. Make sure to drop by and say hello! We're in the atrium. After we closed down for evening on the first day, we headed over to the Interweave Press Party at the Tucson Museum of Art. It was a lot of fun! 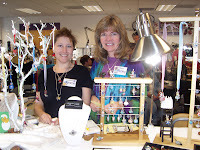 Left: Here's a quick snapshot of Katie Wall of Fusion Beads in Seattle and Heather Wynn of Milton, Florida. Part of the reason why Tucson is so wonderful is that you get to see all your friends from the shows. Sometimes it'll be months (if not a year) from the last time you saw them, and sometimes they are your neighbors and are right around the corner. 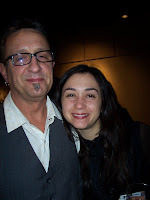 Left: Our local friends from Asheville, Tony Blackwell of Zoa Art and Melissa who works at Chevron Trading Post. Tony makes the most beautiful glass beads. 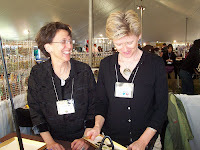 Left: Melinda Barta of Stringing and Beadwork and Jamie Hogsett of Family Glass and author of several books. 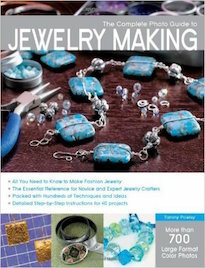 Jamie wrote Simply Stringing and co-wrote the Create Jewelry Series with Marlene Blessing. 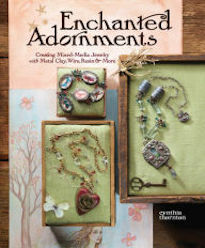 Melinda just finished up a book on focal pieces and will be working on a new one with Danielle Fox. 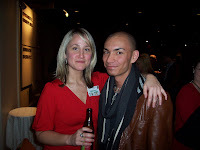 Left: The very talented Heather Wynn and I. I don't get to see much of Heather Wynn these days, which is quite a shame. She's one of my good friends who is one of the sweetest people I know, a genuine good spirit. Heather Wynn makes really gorgeous polymer pieces. Left: Here's a picture of Azalea! 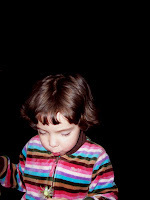 We found a dandelion on the way out of the party and she started blowing on it... making lots of wishes. Seeing her is my wish come true! It has been a long day and I'm tired. It has started off as such a nice trip. How could one not be happy when they are surrounded by their friends and family?